Growing up in a small town in northern England, Graham Holliday wasn’t keen on travel. But in his early twenties, a picture of Hanoi sparked a curiosity that propelled him halfway across the globe. Graham didn’t want to be a tourist in an alien land, though; he was determined to live it. An ordinary guy who liked trying interesting food, he moved to the capital city and embarked on a quest to find real Vietnamese food. In Eating Viet Nam, he chronicles his odyssey in this strange, enticing land infused with sublime smells and tastes. 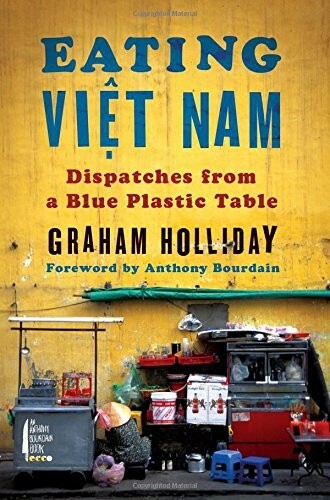 Traveling through the back alleys and across the boulevards of Hanoi—where home cooks set up grills and stripped-down stands serving sumptuous fare on blue plastic furniture—he risked dysentery, giardia, and diarrhea to discover a culinary treasure-load that was truly foreign and unique. Holliday shares every bite of the extraordinary fresh dishes, pungent and bursting with flavor, which he came to love in Hanoi, Saigon, and the countryside. Here, too, are the remarkable people who became a part of his new life, including his wife, Sophie. A feast for the senses, funny, charming, and always delicious, Eating Viet Nam will inspire armchair travelers, curious palates, and everyone itching for a taste of adventure.